Jennifer's true metahuman potential has yet to be reached. However, it's looking like she's about to hit her stride on Black Lightning Season 2 Episode 3. The youngest daughter of the Pierce family has been terrified of her powers lately. She never asked for her abilities, and they continued to cause her problems every time her emotions reached their highest peak. It's not been an easy time for her. Thanks to the unpredictability, she's tried to develop a sense of control and calm. Though, that serene period isn't going to last too long. Based on the Black Lightning promo below, Jennifer's powers have escalated to full electric glory. And from the sounds of her screams, it's definitely against her wishes. The future superhero Lightning is blasting her way onto the scene in a big way! Jennifer is surrounded by her metahuman energy in the short clip we see of her. This advancement in her powers is farther than anything she's done before. Jennifer has gone from shocking people and creating energy auras to full glowing radiance. This surprise is the last thing she needs right now. Between her inner fears of being a monster and her relationship woes with Khalil, there's a lot on Jennifer's plate. Hopefully, Lynn and Jefferson give her guidance during this stressful time. Speaking of superheroes, Black Lightning and Anissa's new alter-ego are heading out to fight another day. We see a quick clip of Jefferson fighting against Painkiller in a one-on-one fight. Black Lightning seems like he's winning the match with his electric grip. However, this could be a ruse, especially since Painkiller defeated Black Lightning once in the past. Jefferson will need to keep his wits sharp. Anissa, on the other hand, is back in her hoodie and mask for another explosive battle. Is she stealing more money from criminals for the poor? We can safely assume Jefferson's words during Black Lightning Season 2 Episode 2 had no effect. Anissa is doing what she feels is right with the gifts she has. Who are the cops pointing their guns at? Will Jennifer ever become accustomed to her powers? What destroyed the car? Check out the trailer below and share your thoughts in the comments. And don't forget, you can watch Black Lightning online via TV Fanatic for all the past action. Black Lightnings airs Tuesdays at 9/8c on The CW. 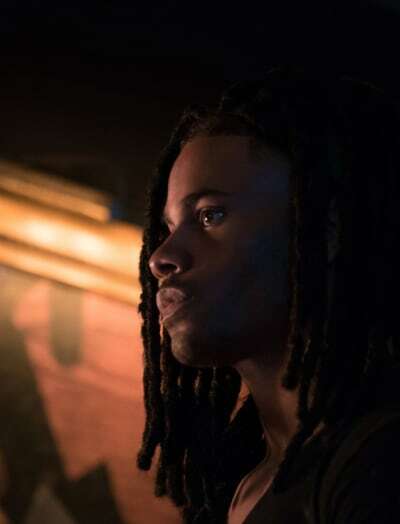 Black Lightning Season 2 Episode 3: "The Book of Consequences: Chapter Three: Master Lowry"
Peter: They’ve been trying to find Tobias for 30 years. Energy might not be the problem. Jefferson: So it’s still on us? Nothing has changed. Peter: Well, not nothing. Tobias has got Painkiller, and he’s got that A.S.A. briefcase of Proctor’s which according to your Ms. Fowdy contains hell. Jefferson: You know, your pep talks need work. Permalink: You know, your pep talks need work. Jennifer: Woah! You’re dating Zoe B?! Jennifer: Yo, that’s crazy! You’re gonna get crushed though; she gonna love you one minute, forget you the next. Anissa: I can’t believe you’re following my dating life on social media! Jennifer: Okay, first of all, ain’t nobody following your dating life, okay. It just popped up. And second, what else do you expect me to do when the only freedom I have is to walk around the block for exercise? Permalink: You’re gonna get crushed though; she gonna love you one minute, forget you the next. 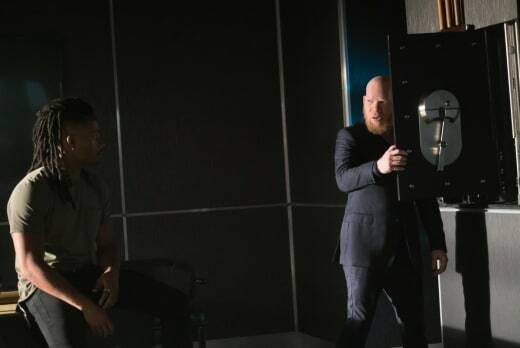 Black Lightning at Midseason: Best Fight Scene, Most Shipworthy Couple & More!